Modern lighting systems for commercial use must meet higher expectations of durability and reliability. This includes, among other things, service life, efficiency, color range, efficacy, and color fidelity as well as a compact design and ease of maintenance. In most cases, spot lights and flash lights with long-life LED modules in various output categories score highly. Their high luminance enables a targeted light control with overall low power consumption. As with all semiconductors, however, the waste heat has to be removed efficiently, otherwise, it leads to hazardous high temperatures despite high efficiency of the tiny LED chip area. Thanks to special LED cooling modules replacing passive heat sinks, modern cooling solutions with active air movement allow for targeted heat dissipation, alongside with size reduction and material gains. Also, completely new design possibilities can be realized, minimizing maintenance of even very complex lighting systems, such as in museums, theaters, and places of worship, storage facilities, street lighting or stadiums (Fig. 1). Active cooling opens new horizons in efficient LED lighting. ebm-papst has developed a line of active compact cooling systems specifically for the market-oriented designs of the new high-performance LEDs. Also, completely new design possibilities can be realized, minimizing maintenance of even very complex lighting systems, such as in museums, theaters, and places of worship, storage facilities, street lighting or stadiums (Fig. 1). Active cooling opens new horizons in efficient LED lighting. The correct amount of light determines how we perceive the world. This is why there are lighting specifiers, who can make us see things “in the right light”. However, it is often difficult even for experts to select the right light source. Ideally, a light source should have a universal application, requiring little space or power. CoB lights (Chip on Board) meet a whole range of industry requirements. However, its semiconductor chip must have targeted cooling in order to maintain its lifetime and color fidelity. To meet the CoB requirements, ebm-papst has developed a line of active compact cooling systems specifically for the market-oriented designs of the new high-performance LEDs. It saves space and allows completely new lighting possibilities. LED bulbs – compact and efficient? 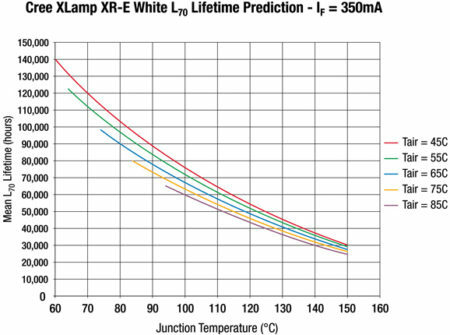 Figure 2: The life expectancy of the LED is essentially dependent on the temperature, which is why targeted heat removal is especially important. When you look at the CoB in detail, you will quickly notice several problems (Fig. 2). As a semiconductor, the LED chip can only operate up to a predetermined junction temperature. Should the temperature rise, the LED quickly develops challenges. These include a reduction in CRI (color rendering index), efficacy and most importantly, a reduction in lifetime. But even at lower temperatures, the material ages rapidly, luminance and efficiency decrease, the color range reduces- in short, its useful life is down. Despite their high efficiency, the waste heat of LED surfaces and the high power density of the LED light sources can be formidable. 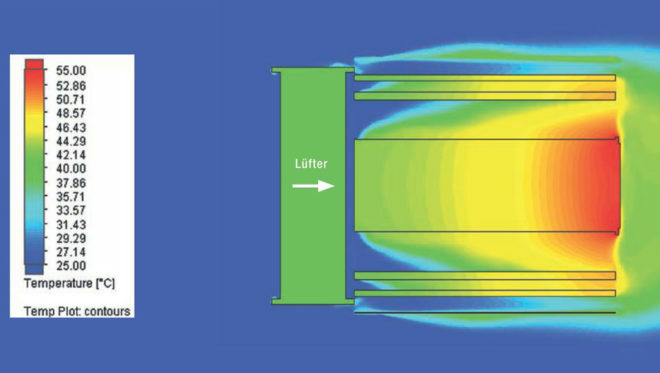 This amount of waste heat must be dissipated in a targeted manner, either by means of conventional (often oversized) passive cooling or via targeted active heat dissipation (see text on the box). Figure 3: Active cooling solutions also impress with their compact design. In principle, the following must be considered: Energy (heat) always flows from hot to cold. For cooling solutions, the total heat resistance, i.e. the sum of individual paths of thermal resistance, must be taken into account. Here, a significant difference between passive and active cooling concept already emerges: The “cooling pathway” LED Chip – substrate – heat sink – air is always the same, but the material part of the same cooling performance varies greatly. The more material is used, the larger the heat sink-is required. Smaller LEDs with the same output and passive cooling are not yet capable of producing smaller fixture designs; because they require large heat sinks as the thermal dissipation/heat transfer to the air becomes a limiting factor for the heat transfer. Passively cooled LEDs therefore require a high use of material and are usually neither compact nor environmentally friendly. At this point, active cooling concepts offer several distinguishing advantages (Fig. 3). 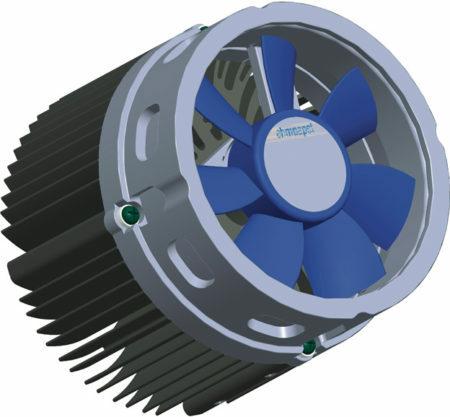 Figure 4: Heat sinks and fans can be combined into a compact module for common LED cooling solutions, which facilitates assembly. Since the heat dissipation from the heat sink to the air is the main resistance in the energy discharge, the largest cooling reserves can also be released. A key feature of active cooling is the targeted air supply to the heat sink. Forced convection, or more specifically turbulent flow is generated towards the heat sink, which considerably improves heat transfer from the thermal mass of the heat sink itself into the neighboring reservoir of air which surrounds the light fixture. Normally, the system works as follows: A small heavy-duty LED surface is attached to the heat sink with a thermal interface material. This provides a much lower thermal resistance enabling a greater transfer of heat from the LED into the heat sink, with between four- and six-fold decrease, the fan creating cold fresh air flow. The electronic cooling experts from ebm-papst St. Georgen have now combined heat sinks and fans into a compact module for common LED cooling solution designs, which makes installation easier (Fig. 4). Its smaller design also saves not only in material but also in weight, and the targeted airflow also ensures that heat transfer impairing deposits such as dust do not adhere at all. The ever-changing requirements of modern lighting LED technology demand optimizing new concepts in simulation programs with material-specific, aerodynamic and drive-specific details, where efficient, reliable cooling modules can be built in the smallest available space. A six-fold decrease in dimensions compared to passive cooling speaks for itself. Other important requirements for the use of active cooling are low operating noise and a longer service life. Most people can perceive noise starting from about 12 dB (A), the fans above reach values between 7 and 19 dB (A), whereas comparable fans available on the market start from 18 dB (A) upwards. For comparison, the noise level in an office is about 35 dB (A), so the modules are inaudible even in museums or theaters. Power consumption of the fan is between 0.18 and 1.1 W at 12 VDC. This allows the modules to dissipate waste heat reliably at between 38 and 200 Watts. Important requirements for the use of active cooling are low operating noise and a longer service life. 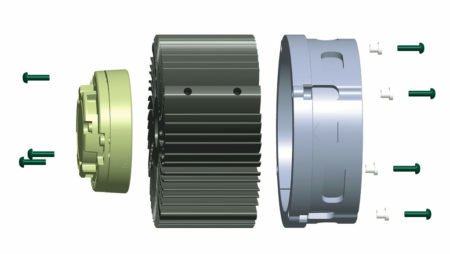 Depending on the output category, round and square axial compact modules have diameters and side lengths which include 40, 50, 60, 80 or 92 or 119 mm with an overall height of 10 to 25 mm. In the radial version with air deflection at 90 °, the dimensions are 51, 76 or 97 mm with the height of 15 to 33 mm. Thus, compared to passive cooling solutions comparable to the cooling capacity, 50 to 100 % higher luminance is possible with the same size. Another positive benefit of the targeted active cooling is the low-temperature color fidelity of the LED arrays. Especially in museums, a high CRI is essential to see the illuminated objects in the right light. As the cooling modules were developed for worldwide maintenance-free use, their service life is comparable to the CoB light sources. At 40 °C, the value is 87,500 to 97,500 h, i.e. around 10 years; at an ambient temperature of 20 °C, the service life is doubled and can often far exceeds that of the LED itself. The green technology from ebm-papst also takes into account an environmentally compatible overall service life concept for development, production, operation and disposal. As a result of their reduced size, modern compact modules for active LED cooling enable completely new lighting concepts, drastically shorten the time-to-market for the chip-specific designs and improve the environmental balance of the lighting concepts due to its low maintenance. The heat discharge coefficient, which is important for heat dissipation, describes the ability of the air to dissipate energy from the surface of a cooler. Among other things, it depends on the air density and the thermal conductivity coefficients of the heat dissipating material as well as the air. The thermal conductivity coefficient is usually calculated using the temperature difference of the parts involved. In contrast to thermal conductivity, the heat transfer coefficient is not a material constant, but is strongly dependent on the flow velocity or the type of flow (laminar or turbulent) as well as the geometric conditions and the surface texture. Active cooling employs more efficient heat dissipation. In the case of laminar flow, the air moves in approximately parallel layers. The heat is transferred between the layers only by very slow heat conduction. Conversely, in case of turbulent flow, intensive swirling and shifting occurs. This results in an almost perfect mixing of air flows. Heat transfer in turbulent flow is therefore a lot more efficient as in the case of laminar flow, which is used in passive cooling (Fig. 5). To use an example from everyday life, a small hair dryer uses 1.0-1.5 kWatts per a blast of turbulent air. On the other hand, an electric convection heater with 1.5 kWatts builds up a lot more with a largely laminar inflow with the same output. Figure 5: The picture shows how the LED heats the heat sink (red, 55 °C) and the fan blows the cool ambient air (blue, 25 °C) through the heat sink and thereby limits the maximum temperature at the LED to approx. 60 °C.